Ellis Law has filed a wrongful death lawsuit on behalf of the mother and son of a 23-year-old man who was shot to death by a Los Angeles sheriff on the property of his Watts home. The area where the home was located is under the jurisdiction of the Los Angeles Police Department, and it is not known why members of the Sheriff’s department were in the area in the first place. According to the LA civil rights attorneys, Arturo Cabrales was at the front of his property, inside a closed gate, with a friend when the incident began. Cabrales was living at the home with his fiancé and 2-year-old son. Cabrales’ uncle had just stopped in front of the home while riding past on his bicycle when two sheriffs turned the wrong way on a one-way street to approach the men. The sheriffs demanded entry into Cabrales’ home. Cabrales responded that they were not allowed onto his property without a warrant. At that point, one of the sheriffs lifted the gate in front of the property and entered the premises. Ex-deputy Anthony Paez, followed Cabrales toward the back of his house. Soon thereafter, Paez shot Cabrales six times – three times in the back, one in the side near the leg and two in the flank. Paez maintains that he fired the shots after Cabrales pointed a gun at him. However, no gun was ever found next to Cabrales’ body during the subsequent investigation. Another deputy at the scene, Julio Martinez, told homicide detectives that the officers saw Cabrales toss a gun over the six-foot chain-link fence lining the property as he fell to the ground. A gun was found on the neighbor’s property. Officers investigated the scene for 7 hours. During the investigation, it was revealed that no officer had actually seen Cabrales throw a gun over the fence. 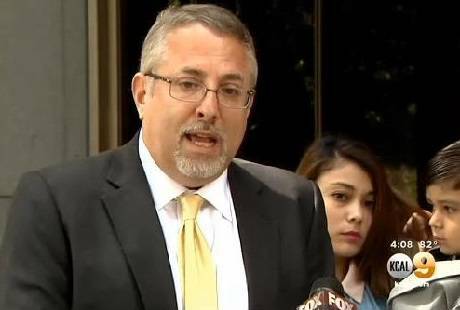 An expert pathologist hired by Los Angeles County, Dr. Marvin Petruzska, also stated in his deposition that Cabrales would have been physically unable to throw a gun over a fence as he was being shot. In addition to the current wrongful death lawsuit, Paez and Martinez are also being prosecuted by the County of Los Angeles for a previous case in which they allegedly planted multiple guns and filed a false police report. Prosecutors in that criminal case allege the sheriffs planted guns inside a marijuana dispensary, which resulted in a six month sentence for a man arrested at the scene. Prosecutors further assert that surveillance video at the scene contradicts reports filed by Paez and Martinez, and substantiates claims that the guns were planted. Ellis Law believes that the officers in the instant case committed the worst acts of Los Angeles police brutality in shooting Cabrales. The firm is also very interested in what appears to be a trend in the behavior of these two deputies. Whether or not police brutality leads to wrongful death, no one deserves to be subjected to such actions in any form. As civil rights lawyers practicing in Los Angeles, we see these types of allegations all the time. LA police officers are by and large brave and men and women with the utmost respect for our state laws and constitution. Society needs them, and we owe them a lot. Yet their role comes with great power that is capable of being abused. The attorneys at Ellis Injury Law understand the complexities of the law surrounding wrongful death and personal injury lawsuits in the state of California. We look forward to bringing justice to the relatives of Mr. Cabrales and to other victims of police brutality in Los Angeles.